Author of a book “How To Launch a Startup“. I believe that together we can build a better future for us and our kids. That’s why I enjoy investing my experience and enthusiasm into building great products with great people. Whether it’s a mental health software that helped thousands of patients better assess their condition, the largest polling app on Facebook with more than 10M users, many small projects that made impact, or currently the solution to help diabetics manage their therapy and live better life. These are the three words that best describe my professional experience. Throughout my career, I have been wearing different hats, but have always been connected to building digital products. I started as a programmer, grew into a project manager and the head of the product division (product manager), then CTO of a marketing agency and finally ended up as a CEO of my own startup. The variety of roles gave me the opportunity to understand IT business from different angles. Whether it’s customers, programmers or executives, I understand their incentives and how they think. I believe that this is quite likely a priceless experience. Thanks to my experience with business development, I also understand how sales and marketing teams work and how to build bridges between them and the programmers. Leading and managing projects always involves working with people. I enjoy achieving goals together, as well as helping the people that I work with to grow. Such as a junior developer who became a team leader after leaving my company. Or our CTO who grew into starting his own successful business. That’s also a reason why I speak about entrepreneurship and building products at universities and for non-profit organizations in my free time and mentor startups. Running a mental health tech startup helped me a lot with becoming very well aware of mental health. Whether it’s my own or of the others around me. I’ve learned that many people don’t realize its importance, so I do my best to raise awareness. Including sharing also my own story that was published by Huffington post. I almost burnt out three times and was able to recognize the early symptoms only because I was aware of them. My decision to start seeing a psychologist in early 2017 was one of the best ones in my life. As a part of my personal therapy to avoid burning out, I started summarizing all my experience from launching and running my startup. Starting with validating the idea, moving through building the team, creating and selling the product and all the way to finding investors and raising money to grow further. This summary ended up being a book that is a great start for anyone who is even remotely interested in building products that solve real problems and have their own companies. 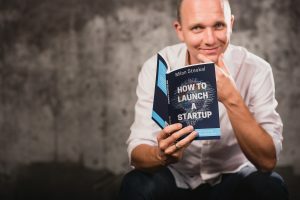 You can find the book “How To Launch a Startup” published on Amazon. Let’s make this world better together.